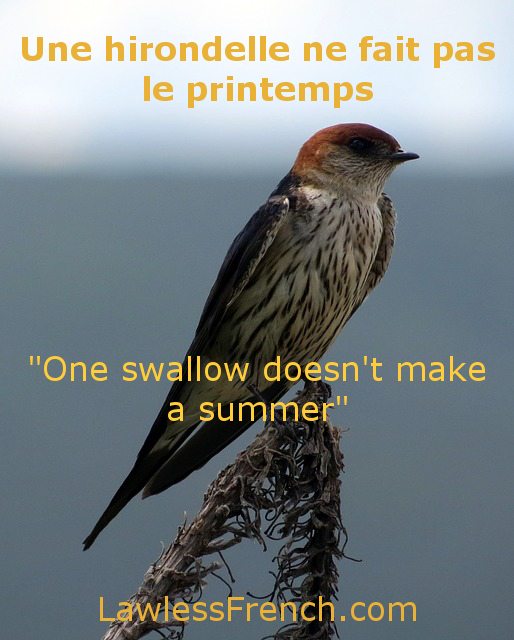 Usage notes: Une hirondelle ne fait pas le printemps is a French proverb with a very similar English equivalent: "One swallow doesn’t make a summer." Interestingly, the season is different – in French, a swallow is a potential sign of spring, while in English, it means summer might be just around the corner. So much for the literal meanings. The proverbs Une hirondelle ne fait pas le printemps and "One swallow doesn’t make a summer" are far more commonly used figuratively, to mean that one good thing doesn’t necessarily mean that the general situation is better. Elle était de bonne humeur hier, mais ce matin, elle est encore ronchonne, comme d’habitude. Eh ben, une hirondelle ne fait pas le printemps. She was in a good mood yesterday, but this morning, she’s grouchy again, as usual. Oh well, one swallow doesn’t make a summer.